Located on the Atlantic coast, Virginia is one of the oldest US states. It is also known as the "Mother of Presidents". Richmond is the state’s capital. The state has several colleges and universities offering a wide array of degree programs in different concentrations. The University of Virginia is one such school, founded by none other than by one of the founding fathers Thomas Jefferson. Health related careers are in-demand in the state of Virginia. Nursing, especially has a great future in the state since O*NET OnLine Virginia specific statistics predict 13% job growth in the field from 2012 to 2022. Registered nurses earned a median yearly salary of $62,600 in 2014 or $30.10 per hour. There are many schools that offer training programs for prospective nursing professionals. After being licensed, graduates of these programs can possibly work in labs, clinics, hospitals, nursing homes and doctor’s offices. Nursing Schools in Virginia offer programs leading to Licensed Practical Nurse (LPN), Licensed Vocational Nurse (LVN), Diploma in Nursing, Associate Degree Nursing (ADN), Bachelor’s of Science in Nursing (BSN), Master’s of Science in Nursing (MSN), and doctoral degrees in nursing.The duration of these programs vary. The choice of a program depends on the career goals of a student. Those who are interested in pursuing entry-level positions as nurses can enroll in LPN/LVN programs. On the other hand, students who want to work as registered nurses must pursue a diploma or ADN, if not a BSN. Practicing nurses interested in working in nursing administrative settings, must consider enrolling and completing the MSN program. A PhD in nursing may lead to a career in academia. Students enrolled at Nursing Schools in VA may study courses such as primary healthcare, pharmacology, physiology, anatomy, record keeping and biosciences. They may also learn clinical nursing practice and health optimization. The following is not an exhaustive list of nursing schools and institutes approved by the Virginia Board of Nursing. This is typically a 5-semester degree, which may be awarded upon successful completion of 66 credit hours. Upon completion, graduates are eligible to take the National Council Licensure Examination (NCLEX-RN). It is mandatory; all nurses who intend to practice must clear this exam to get licensed. An associate degree in nursing, teaches the following courses to its students. In addition to classroom-based teaching, students also learn from conducting independent research. The research may be conducted individually or as part of a team. All graduates are eligible to take the National Council Licensure Examination (NCLEX-RN). In addition to providing students with a foundation for professional practice, RN to BSN program provides them with an opportunity for further education as well. This is an accelerated pathway to a BSN degree wherein students may complete their degree in less than 4 years. The program however is open to those licensed nurses with a diploma or associate degree in nursing. Furthermore, prospective applicants must have taken the following courses prior to applying for the program. The program is for those nurses seeking leadership roles in healthcare delivery system. Eligible nursing students may receive financial aid packages from their schools in the form of grants, scholarships, loans, fellowships and teaching and research assistant positions, etc. For further information, contact your school’s financial aid office. 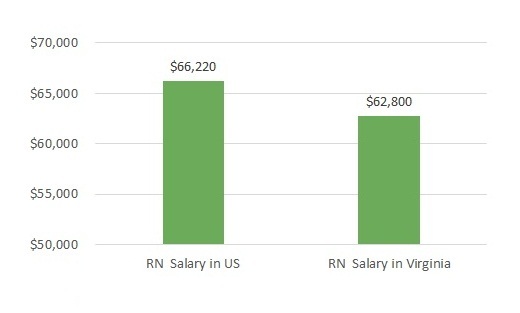 How much do nurses make in Virginia? RNs nationally earned a median annual income of $66,600 or $32.04 per hour, in 2014. Q:What are the various programs offered by nursing schools in Virginia? A:Nursing Schools In Virginia offer a number of programs among which the most popular are LPN, BSN and MSN. The duration of these programs may last from 1 year to almost 4 years. Choosing which program to do is purely dependent on the career goals of a student. LPN is for those who are considering an entry level positions in nursing. BSN and MSN are courses for those who want to be Registered Nurses. Q:What are the most common nursing specialties I can pursue from Nursing Schools Virginia? A:Nursing programs can be pursued in a number of different specialization areas. Nursing is a broad field and can be categorized into the following: midwifery, mental health nursing, emergency nursing, critical care nursing, geriatrics nursing, case management nursing, public health nursing, and rehabilitation nursing. You can opt for any of these according to your interest and career goal.